Hanging with Sam, our trainer. Making the world a better place can seem like a sisyphean task. As humans, we are incredibly flawed. There are so many things we must do better. So much we must help with. So much to take care of. It's overwhelming. Of course, that means there are also so many possibilities for change, for improvement, for betterment. Any step forward is a cause for celebration. Three steps forward is truly an inspiration. Dog treats that are both nutricious and delicioius. In an unassuming strip mall in Olathe, Kansas, tucked between a tax service and a jazzercise facility, you’ll find Inclusion Connections. Inside, a group of incredible people are meeting life’s challenges head on, inspiring and teaching others, cleverly re-purposing items to keep them out of landfills, and making adorably delicious dog treats. 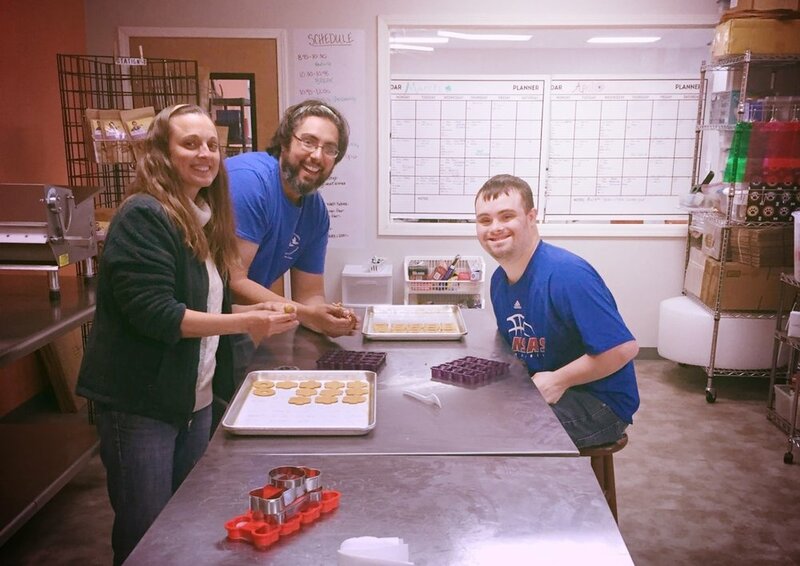 Working to care for and improve the lives of individuals with special needs, Inclusion Connections approaches their care and life-enrichment in innovative ways. They teach yoga and zumba, have art and cooking classes, train service dogs, and with their flagship program, PawsAbilities, they teach skills that can be used to gain real, meaningful employment. A good part of our day was spent under the tutelage of Sam, a veteran of the PawsAbilities program. A testament to the success of the program, he happily and confidently showed us the ropes of preparing peanut butter dog treats. The smell of peanut butter was intoxicating. Left alone for a few minutes, it took every bit of willpower we could muster to not eat the treats ourselves. After returning from helping process a sale for a customer, Sam put us to work cleaning up after the days activities were done. 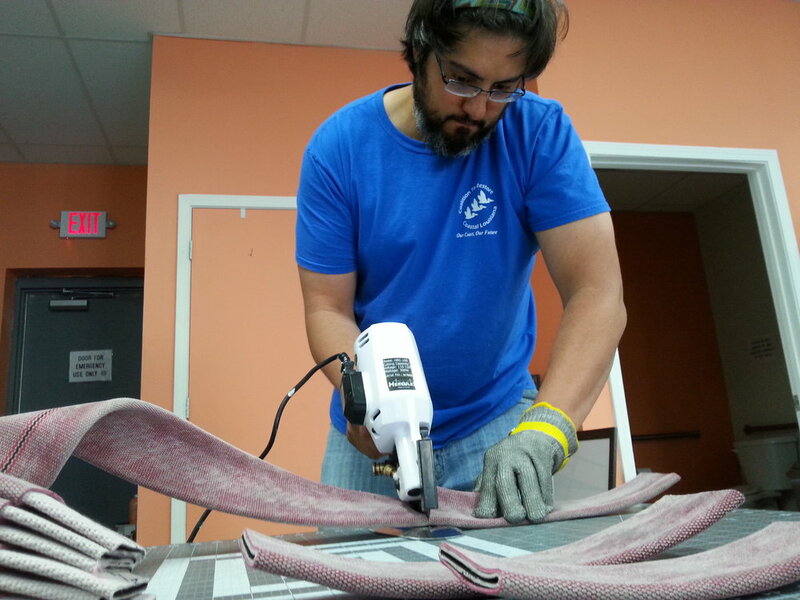 Cutting fire hose is apparently serious business, judging by that face. Sam's leadership and skillset are no accident. PawsAbilities exists not just as a fund-raising tool. 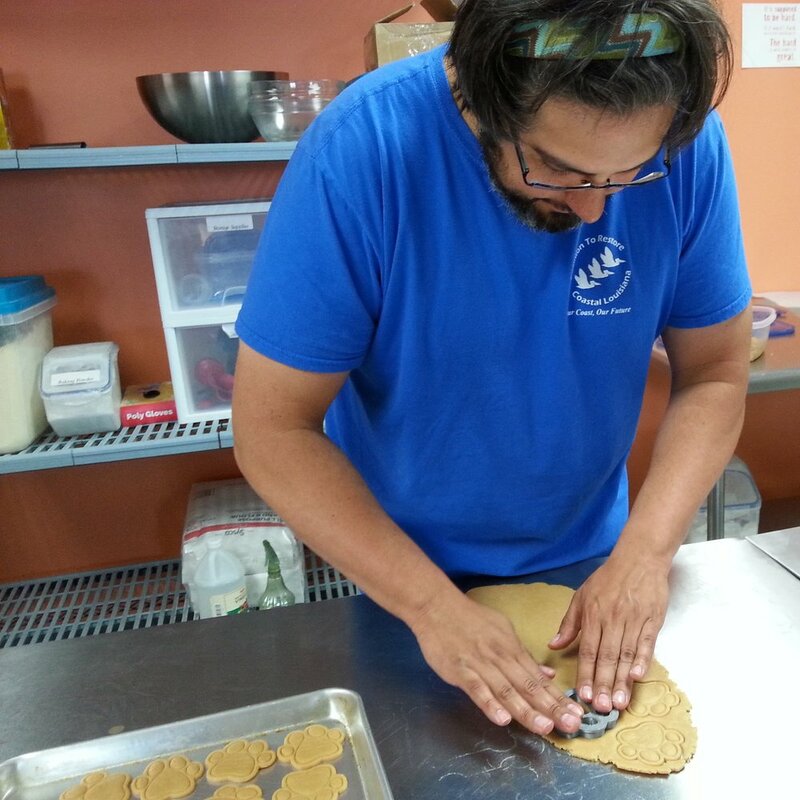 They teach baking skills by having participants create made-from-scratch dog treats. They teach sewing skills by making dog chew-toys out of nearly indestructible old fire hose and old clothing, and also make dog accessories out of old clothing. The treats, toys, and accessories are then sold to the public, teaching retail skills. All of these abilities give the participants of Inclusion Connections not just confidence and pride, but valuable job training too. Nestled in that barely noticeable strip-mall, on an otherwise quiet Friday, we were the beneficiaries of new skills, new insights, new friendships, and Sam taught us the ever important lesson that when there's a show-down between Kansas and Kansas State universities, you better go with the Jayhawks. We all have something to give. We all have something to learn. We're all in this together. Through inclusion and innovation, through love and education, let's break the cycle of Sisyphus and collectively accomplish the task of being better. Being more. Also, let's bake more (especially if it involves peanut butter).